In case you missed the barrage of social media selfies, Conor McGregor has been in Liverpool this week partying in the port city. The MMA champ shared a photograph depicting the results of his Great British bender, which kicked off at the Grand National at Aintree last Saturday. The trip has been well-documented on McGregor’s Instagram feed. The photo series culminated in a rather bleak looking picture aboard his private jet. While the big red bag of money is a welcome sight, McGregor himself looks a little worse for wear with a cut on his hand and a rather dazed expression. We’ve all been there… minus the cash and the jet. Calm down, calm down… I'm here all week. McGregor turned heads with his patterned, open-collared shirt at Aintree. Straight from the races, he made a guest appearance at Liverpool’s Mansion nightclub before spending Sunday night at Empire. The following night McGregor was filmed climbing high to the top of a tree house at a house party in Huyton. Conor McGregor in a treehouse after a 3 day bender in Liverpool. After his extravagant Liverpool experience, fans waited to see him off. 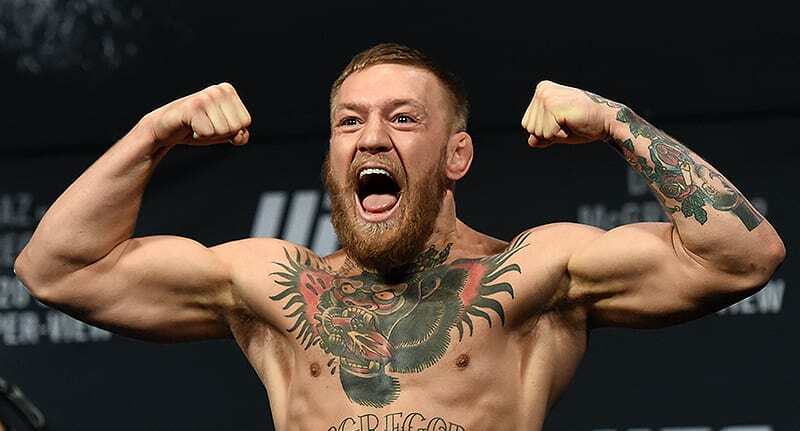 The Notorious was ‘smuggled’ out the back exit of Liverpool’s Hilton hotel, as eager crowds waited for the MMA champ beside his white Rolls Royce, which was parked out the front. The results of his Liverpudlian sesh have been duly noted by locals. This comes after McGregor’s coach announced he’s building a secret boxing ring in which he can train for the imminent fight with Floyd ‘Money’ Mayweather. By the looks of his post-bender private jet picture, The Notorious wouldn’t last one round in the Octagon.